"I believe cookie cutters are best left in the kitchen." I coach a very limited number of athletes who have a variety of goals, from sprint to Ironman, as well as those focused solely on competing in marathons. I believe the coach/athlete relationship must be based on mutual respect and trust. We work together as a team to consider and set realistic goals, and we factor in every aspect of your life so that you maintain a healthy family/work/training life balance. I hold a degree in Exercise Physiology & Sports Science from the University of Wisconsin, La Crosse, plus numerous training certifications and the experiences of racing as an age-grouper and pro in hundreds of events, from Ironman to marathons. I believe cookie cutters are best left in the kitchen, and "cookie cutter" training plans will never be used with any of my athletes. If you are interested in a coaching relationship that involves honesty, commitment and training and adapting your body intelligently for the long-term, then reach out to me. “Should I get a coach and who can I trust to supply me with 9 months of daily workouts?" Those were the questions running through my mind as I set my sights on getting a PR at IMWI 2013. I am 49 years old and this would be my fourth Ironman, including two prior IMWI races. Both previous IMWI races were fun, positive experiences overall, but finish time was not where I wanted it to be. I have known Jessica since 2012 when she moved back to the Green Bay area. Being a very successful pro triathlete and having discussed training with her on some group cycling rides, Jessica was my first and only choice. Candidly, I thought, boy, I have been racing for nearly 25 years, what can Jess possibly add that I don’t know or haven’t experienced already? Let me just say, I wish I had come to her sooner. In short, after starting with Jessica in January and working with her up to IMWI in September, I can say without a doubt I approached the race mentally sound, physically in the best shape of my life, and simply ready to crush it. Throughout the training year, Jessica was compassionate, encouraging, generous with her time, and available to handle any issue large or small. The daily workouts I received from her were challenging-some I thought at speeds I could not maintain. Yes, there were even days I was cursing her silently thinking is she crazy, I can’t do that. Yet, Jessica was right on. I did hit the speeds and distances she wanted. And the workouts were creative, dare I say even fun to do. Our schedules allowed for some of these workouts to be done with her (okay, once the interval started I often was watching her pull away-but she has a job to do as well). How many age groupers can say they get to work out with their pro triathlete coach? Of course, this was all part of a greater plan to get me to the starting line healthy and fit for both A and B tri races as well as the big dance in Madison. Did Jess deliver? You bet. I had PR’s in both my 70.3 races this year. And IMWI was a PR by 30 minutes for me. Thanks to those damn track and tempo runs, often as the second workout of the day, I was able to run the entire marathon—including Observatory Hill on the second pass which I had yet to do in my previous races. Anyone on the fence or even thinking about hiring Jess as a coach, my firm belief is pull the trigger. She has the expertise to handle all levels of tri and running athletes- novice to the very advanced. And I don’t stand alone in this endorsement. I know and train with others that have set amazing PR’s under her tutelage. 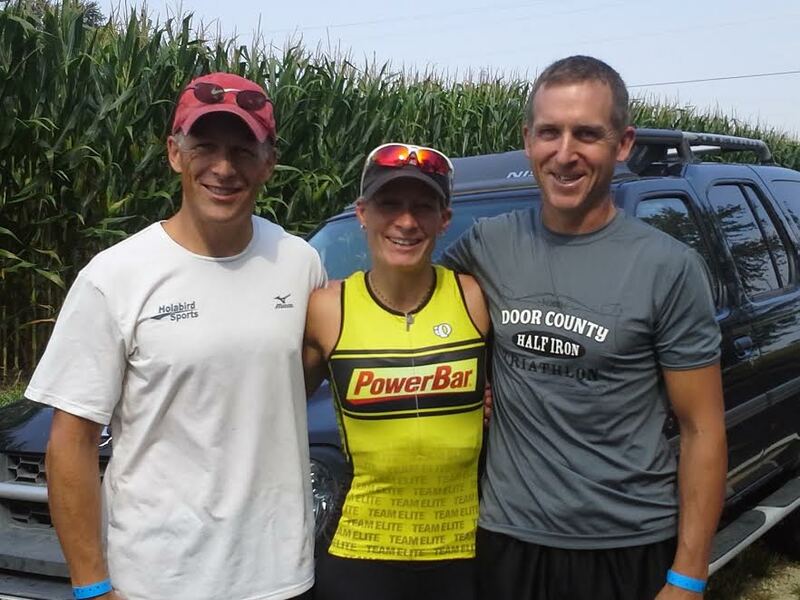 Bill Roach (pictured far left), accomplished a 30-minute Ironman PR under Jessica's guidance.